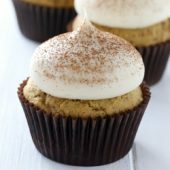 Moist homemade spiced pumpkin cupcakes, topped off with brown sugar cream cheese frosting and a dusting of cinnamon. A perfect Fall dessert! Preheat oven to 350°F. Line a standard cupcake pan with 8 paper liners. In a large bowl or stand mixer, cream together butter and sugars until light and fluffy. Beat in egg and vanilla. Scrape bowl as needed. Mix in baking soda, baking powder, salt and spices. Mix in flour, followed by pumpkin puree. Continue mixing until fully combined and no streaks remain. Divide batter between 8 paper liners using a large cookie scoop. Bake for 20-22 minutes or until a toothpick inserted comes out clean. Cool in pan for 2 minutes or until easy to handle, then transfer to a wire rack to cool completely. Lightly dust frosted cupcakes with cinnamon using a small mesh strainer or sugar duster wand. Store cupcakes in an airtight container for up to several days. *A jumbo round piping tip was used in this recipe.